While boarding and settling down in the school van, my students talked animatedly about our field trip to Princeton to attend a Claudia Rankine reading, about what they wanted to hear on the radio, and if we could make a pit stop for snacks. The small group was made up of members of my Craft of Poetry and Prose Workshop classes who didn’t have any schedule conflicts that day. 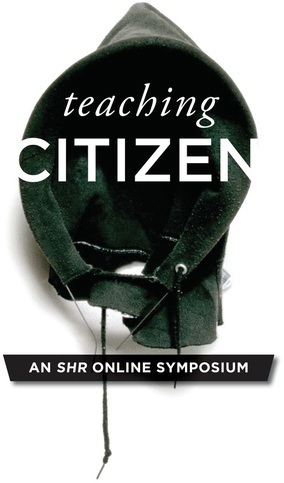 The poetry students had read Rankine’s Citizen in preparation for her reading, and the others were attending without any prior knowledge of Rankine or her work besides what I’d said while briefing them about the field trip opportunity. One of my prose students, a proven and vocal workshop leader, sat quietly in the van, headphones in. I wondered what was up, but I didn’t want to pry, especially with other students around. When we got to the event, however, the student sat next to me and told me about the recent death of one of his dearest friends, a poet, Black Lives Matter activist, and community organizer in Columbus, Ohio. I mention all of this because of how the conversation intensified my experience of listening to Rankine and how that intensification allowed me to reflect on the implications of an undergraduate class reading Citizen. Throughout Rankine’s delivery, I found myself thinking again and again about my student’s friend and the impact of that young man’s life on his community. I began to wonder if the essay about race my student had turned in the previous semester had been encouraged by his friend. I was once again reminded that students write out of their lives, what matters to them, who matters to them. My students weren’t writing for me; they were writing for themselves and their loved ones. I also began to listen expectantly to Rankine with the hope that, in some way, she would speak directly to my student or at least seem to, in order to comfort him. I then realized just how much I was relying upon Rankine in terms of all of my students’ education, how much I wanted them to hear her voice and her words, and not my own. As a teacher, I was giving up teaching for the moment in order to be taught, to sit beside my students in the same row of the theater, to see them listening and to listen myself. I’ve begun to wonder if those moments in which we teachers listen to—and with—our students are often some of the most instructive. At the very least, they tear down the classroom hierarchy, subverting the privilege of educators (educational, financial, or otherwise), and position the act of listening as equally valuable and meaningful to both teacher and student. From this moment on, I began to think about my role as something of a teaching assistant to the faculty of our texts. For that reason, I assigned Citizen the following year, just after it was published. Although I was at a different institution by then, I had a similar group of students. After class one day, one of my only students of color came up to talk to me about the text. “I’ve never had anyone assign a book by a black woman,” she said, which is exactly why we, as creative writing teachers, should assign a book like Citizen, especially as it engages and exposes racial microaggressions, for isn’t the redaction of these voices on syllabi a microaggression itself? In assigning Citizen as the first book of the semester in my Craft of Poetry class, I hoped to establish the class as a space in which all the students could contribute and share their individual experiences. At the small college where I teach, the creative writing classes have a more diverse student body than our other English courses. In my Craft of Prose class in the fall, over half the class was made up of people of color. "As we are tossed about in the highly political world we live in, she shares a resolute answer that we need." "There are few times in this country when race, a purely visual act, can be put to paper. How do you describe when someone calls you 'boy' when asked to vacate a premises, or when a close friend confuses you for another black worker, calls you two 'essentially brothers' even though you both are not only two separate skin tones but entirely different bone structures? Attempts to explain this can sometimes fall on deaf ears. These situations become submerged in apathy, so much so that it could convince you that you just might be crazy. Claudia Rankine’s Citizen not only describes these situations with the lasting pain these singular exchanges can have, but uses physical images that give context and character to these events so that if words fail, pictures will not. Rankine’s grasp of poetic prose and mastery of the second-person narrative is almost as beautiful as the imagery she has tamed." “It hits home for people of color. . . . It took people like Martin Luther King, Jr., and even Claudia Rankine, to talk or even write about these problems to bring a change to society and bring justice for everyone." EMILIA PHILLIPS is the author of two poetry collections, Signaletics and Groundspeed; and three chapbooks, most recently Beneath the Ice Fish Like Souls Look Alike. Her poems and lyric essays appear in AGNI, Beloit Poetry Journal, Blackbird, Boston Review, Crazyhorse, Green Mountains Review, Gulf Coast, Harvard Review, The Kenyon Review, Narrative, New England Review, Ninth Letter, Ploughshares, Poetry, and elsewhere. She received StoryQuarterly’s 2015 Nonfiction Prize, judged by Leslie Jamison, and The Journal’s 2012 Poetry Prize, judged by G.C. Waldrep, as well as the 2013–2014 Emerging Writer Lectureship from Gettysburg College and fellowships from the Bread Loaf Writers’ Conference, The Kenyon Review Writers’ Workshop, U.S. Poets in Mexico, and Vermont Studio Center. She is the Assistant Professor of Creative Writing at Centenary College of New Jersey and poetry faculty for the Tinker Mountain Writers’ Workshop.